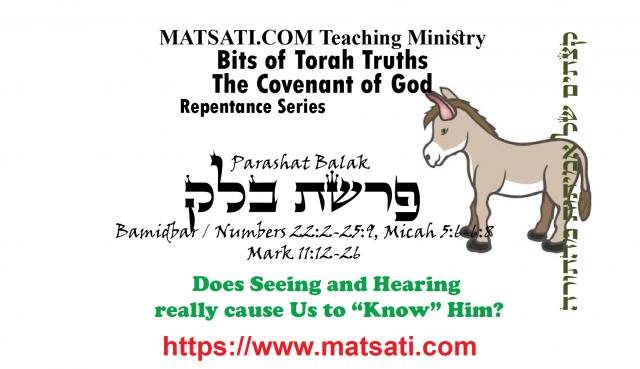 This weeks reading is from Parashat Balak (Bamidbar / Numbers 16:1-18:32), Balak king of Moab saw what the children of Israel had done to the Amorites and both he and the people of Moab were afraid being very anxious about Israel’s presence. As a result, Balak asks for help from a man named Bilam. Now Bilam was well known according to Balak saying: כִּי יָדַעְתִּי אֵת אֲשֶׁר-תְּבָרֵךְ מְבֹרָךְ וַאֲשֶׁר תָּאֹר יוּאָר “For I know that he whom you bless is blessed, and he whom you curse is cursed.” (22:6). Bilam through prayer was in contact with the Lord as we see in the repeated references that God said do not go to Balak. Bilam eventually goes with the men and God’s anger burned (וַיִּחַר-אַף) against Bilam and the Angel of the Lord stood in the way of Bilam’s donkey to slay him. Bilam was very persistent; three times he turned to continue on his way being unaware that his life is in eminent danger. How often do you think we walk in eminent danger if we are not walking and living according to God’s Word? Think about this for a moment. Last week, Moshe and Aaron failed to remain in God’s Word and failed to sanctify the Name of God (see Bamidbar / Numbers 20). In this week’s reading, Bilam not only did not remain in God’s Word he also did not believe God’s Word. If it were no for the mercy of God, Bilam would have died. Next articleTehillim / Psalms 20, Part 1, We are able to call out to Him!